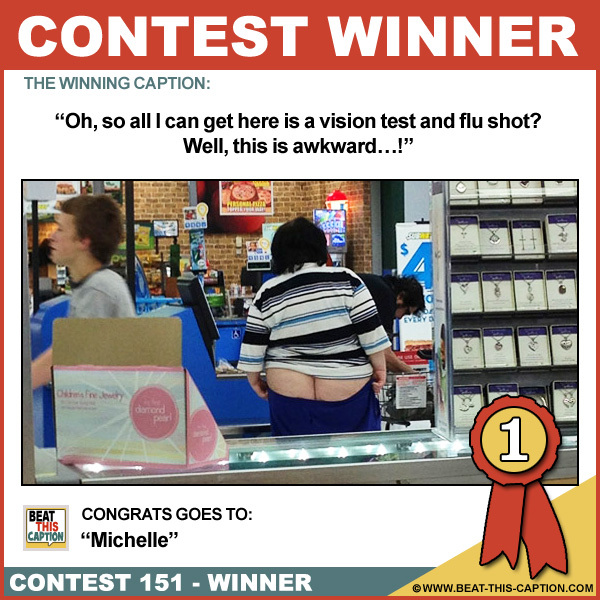 Beat This Caption Contest 151 Winner – Caption Contest Funny Clever Witty Enter Today! Great Caption! You had me at “Ohhhhh” LOL :) You WIN! No matter which way she turns…it always points North! Clean up on aisle 3! Oh, that reminds me, I need to buy asprins! You still sell them button fly jeans here? Why do beautiful young girls with trim figures never dress like that? I have in mind twin lockets that smoothly fit together! Put your mail in my slot!